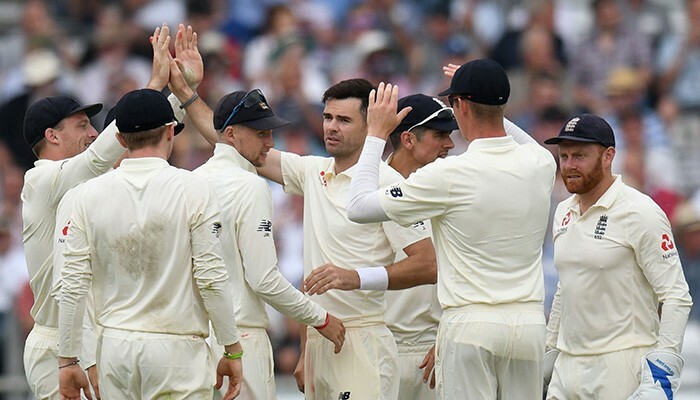 Geo.tv – England´s James Anderson (C) celebrates with teammates after taking the wicket of Pakistan´s Pakistan´s Sarfraz Ahmed for 14 on the first day of the second Test cricket match between England and Pakistan at Headingley cricket ground in Leeds, northern England on June 1, 2018. England´s James Anderson (C) celebrates with teammates after taking the wicket of Pakistan´s Pakistan´s Sarfraz Ahmed for 14 on the first day of the second Test cricket match between England and Pakistan at Headingley cricket ground in Leeds, northern England on June 1, 2018. Photo: AFP LEEDS: Dominic Bess belied his position as a night watchman by guiding England into a first-innings lead against Pakistan on a rain-marred day of the second Test at Headingley on Saturday. Bess was 40 not out, having scored 57 on debut during England´s thumping nine-wicket defeat by Pakistan in the first Test at Lord´s. England were 106 for two, 68 runs adrift of Pakistan´s lowly 174, when play eventually got under way at 2:45 pm (1345 GMT) some several hours after the scheduled 11:00am (1000 GMT) start time. Pakistan only need to avoid defeat at Headingley to seal a first series win in England for 22 years.